Seth Meyers goes John Oliver in frustrated Super PAC tirade: "There might be a person Chris Christie calls sugar daddy"
If you think that's bizarre, you'll want to see what donors got to do with candidates at the Romney Summer Camp. Seth Meyers had a few words for the role money plays in politics Monday night. On Late Night with Seth Meyers the comedian cited the New York Times story over the weekend which detailed 50 percent of the campaign funding this cycle has come from 158 incredibly wealthy families. One such donor is Chicago hedge fund billionaire Kenneth Griffin who earns about $68.5 million per month. He's donated about $300,000 to Republican campaigns, but if you adjust what he makes it is the equivalent of $21.17 for the average family. Meyers says these campaigns are much longer as a result, showing a clip of a CBS News correspondent Julianna Goldman saying that candidates once dropped out after running out of money. But with all the unlimited funding available, candidates jump out only when their sugar daddy or sugar momma turns off the cash. "And now, try sleeping tonight knowing there might be a person Chris Christie considers his sugar daddy," Meyers said. Basically, these Super PACs are the reason that this campaign is starting so early and keeping people alive long after their expiration date. "So next time you're wondering why Bobby Jindal is still in the race," Meyers said. "Just know it's because a rich person said 'I want to see the little boy standing at the podium. He tickles me!'" Meyers brought up the Romney Summer Camp for millionaires to meet and get to know candidates like some kind of bizarre arranged marriage ritual. The event allows candidates to find that perfect funder, talk through issues and strategy and eventually snuggle up with their perfect mate. Events included: Sunrise Yoga, horseback riding with Ann Romney and a scenic hot air balloon ride. Meyers has a few other options for events, however, in the video below. 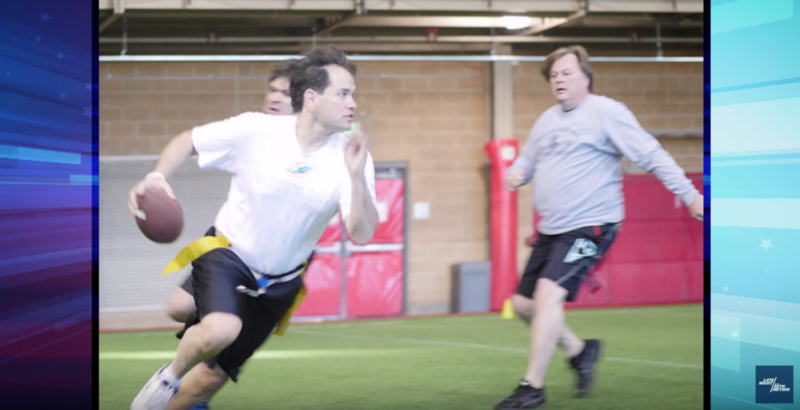 But the highlight of the week was Marco Rubio playing flag football with potential donors. "And it doesn't even seem like those donors are having fun," Meyers joked. "Look at the guy on the right in this photo:"
"Still, it went better than the other time Marco Rubio played football," Meyers said showing the time Rubio hit a kid in the face with a ball.